Two Suicide bombers detonated explosives-rigged vehicles at an elementary school and a police station in northern Iraq, killing at least 15 people, 12 of whom were children. 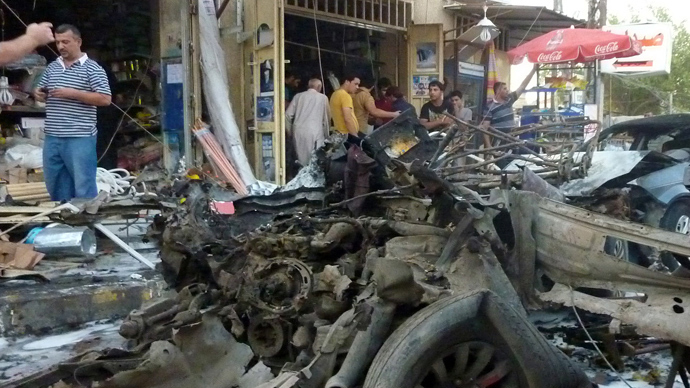 14 more were killed in a suicide attack on Shi’ite pilgrims in Baghdad. Tal Afar mayor Abdel-Aal al-Obeidi says the twin blasts hit the nearby Shi'ite village of Qabak on Sunday morning, the start of the local work week. Tal Afar is 420 kilometers northwest of Baghdad, not far from the Syrian border. A suicide bomber drove a truck packed with explosives into the playground of the elementary school, blowing himself up. Just minutes earlier, a separate suicide bomber targeted a police station. There are conflicting report on the identity of the victims. AFP reports that twelve children and the school's principal were killed in the attack, which caused part of the single-story building to collapse, possibly trapping more people inside. Two officers were also reported killed in the attack on the police station. Reuters, however, says that there were no fatalities in the attack on the police station, while 14 children and their principal died when militants targeted the school. 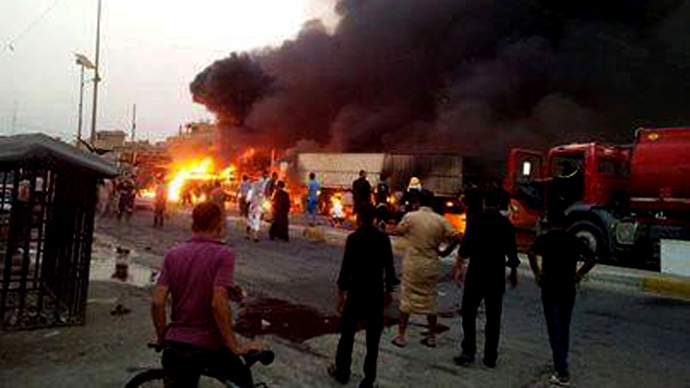 Al-Obeidi said at least 90 more were injured in the dual blasts. 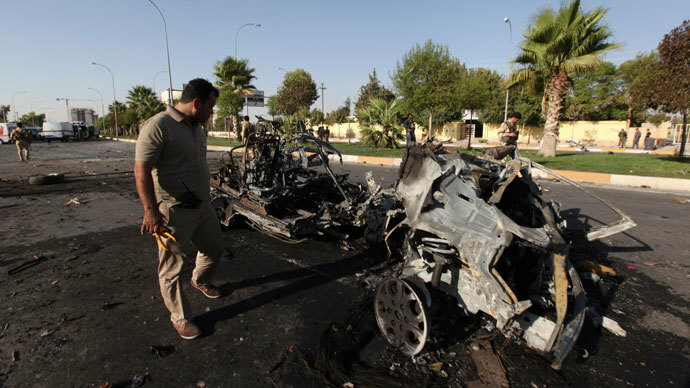 No group has claimed responsibility for the attacks, but such bombings are the hallmark of Sunni Islamists allied to Iraq’s branch of Al-Qaeda. The area around the afflicted village, which only has a population of 200, has long been a hotbed for Sunni insurgents and a corridor for extremist fighters arriving from nearby Syria. Meanwhile, a separate attack targeting Shiite pilgrims passing through a Sunni neighborhood in Baghdad brought the total death toll for Sunday to 27. Police said 14 people were killed and 23 wounded when a suicide bomber targeted the pilgrims in the northern neighborhood of Waziriyah. "Pools of blood, shoes and flesh are covering the ground," a policeman at the scene of the blast in Baghdad told Reuters. 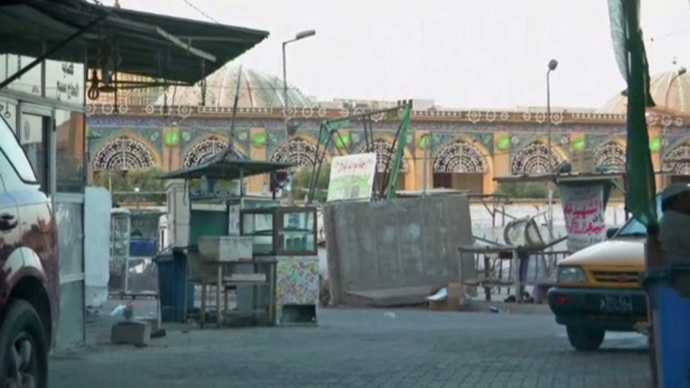 The attack came on the anniversary of the death of a Shi'ite imam. Women and children were among the victims, the policeman said. Relations between Sunni and Shi’ite’s in Iraq have become increasingly strained in recent times, in part due to the conflict in neighboring Syria, which has attracted fighters from both sides of the sectarian divide to engage in the broader regional proxy war. 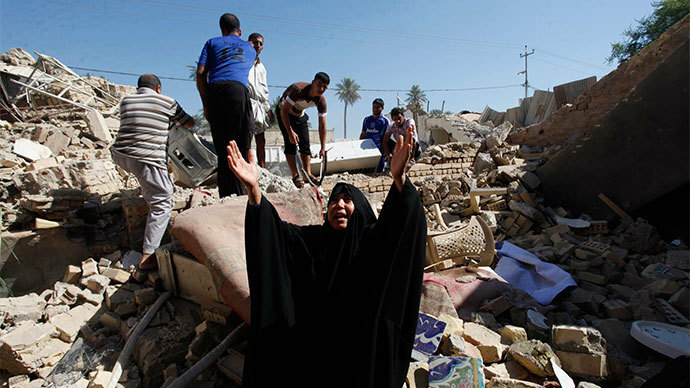 That, coupled with internal tensions between the two dominant denominations in Islam has led to the deadliest wave of violence to strike Iraq in 5 years. On Saturday, 73 people were killed in a raft of attacks throughout the country. Police officials told AFP that at least 49 people died when a suicide bomber targeted Shiite pilgrims passing through the largely Sunni neighborhood of Azamiyah en route to a nearby Shiite shrine. Seventy-five people were reported wounded in the blast. Other attacks across the violence-torn nation claimed 24 lives. The deaths were confirmed by hospital officials. 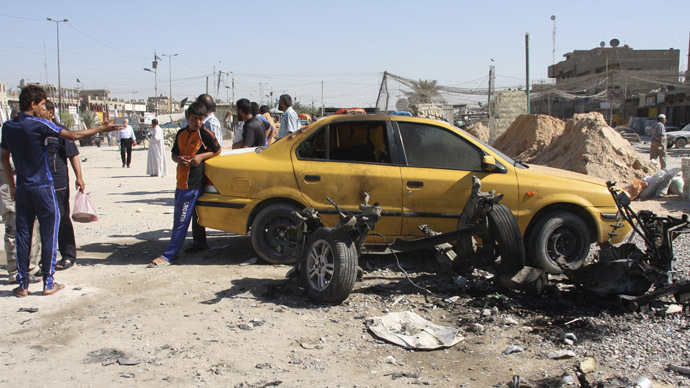 Around the same time the blast targeted Shiite pilgrims, a suicide bomber detonated himself in a café in Balad - a largely Shiite town surrounded by Sunni communities, located about 80 kilometers north of Baghdad. The attack claimed 13 lives and left 22 wounded. Three people were also killed and 13 were wounded in the religiously mixed Baghdad neighborhood of Baiyaa after a hidden bomb went off inside a café. Two journalists were gunned down in a separate incident in Mosul, located in the north of the country. Iraqi forces have carried out operations against militants in recent months but have not managed to curb the violence sweeping the county. More than 4,800 people have been killed in Iraq this year according to figures published by AFP, which are based on security and medical sources.